JERUSALEM -- The Israeli military said Sunday it had rescued members of a Syrian volunteer civil organization from the volatile frontier area and evacuated them to a third country, the first such Israeli intervention in Syria's lengthy civil war. Jordan confirmed that 800 Syrian citizens have entered its territory to be resettled in Western countries, including Canada. The volunteers, known as White Helmets, had been stranded along the frontier with the Israeli-occupied Golan Heights following the latest Syrian government offensive in southwestern Syria. The military said its actions did not reflect a change to Israel's non-intervention policy in Syria's war, now in its eight year, where all the warring parties are considered hostile. The Syrians would remain in Jordan for three months before moving on to Canada, Britain and Germany, the Jordanian Foreign Ministry's spokesman Mohammed al-Kayed said. In a statement released early Sunday morning Foreign Affairs Minister Chrystia Freeland pledged Canada's continued support for the White Helmets. "Canada, working in close partnership with the United Kingdom and Germany, has been leading an international effort to ensure the safety of White Helmets and their families," she said. Praising the White Helmets as "courageous volunteers" who risk their lives to help fellow Syrians targeted by senseless violence, Freeland said "Canada will continue to provide significant humanitarian assistance to the people affected by this conflict in Syria." 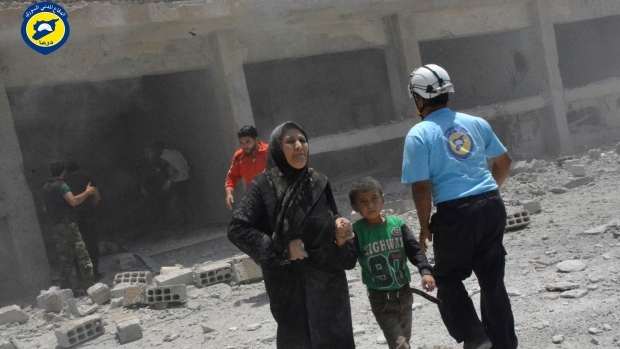 Raed Saleh, head of the Syrian Civil Defence as the White Helmets are also known, said a number of volunteers and their families were evacuated from a dangerous, besieged area and had reached Jordan. He did not elaborate on the numbers of those evacuated. The Associated Press first reported on Friday that U.S. officials were finalizing plans to evacuate several hundred Syrian civil defence workers and their families from southwest Syria as Russian-backed government forces closed in on the Quneitra province, along the Golan Heights frontier. Israel has been sending aid into Syria for several years and has provided medical treatment to thousands of Syrians who reached the Golan Heights frontier. In the past two years, the Israeli military says it has delivered more than 1,500 tons of food, 250 tons of clothing and nearly a million litres of fuel.